The tradition of jumping into Mirror Lake could come to an end under an Ohio State plan to drain and renovate the surrounding area. Work on the lake, which is set to begin Tuesday, will likely take about 18 months according to university officials. Plans to install wetland marshes around the lake could make future jumps — which have taken place before the OSU-Michigan football game in November in recent years — difficult, if not impossible. Last year, Austin Singletary, a third-year in human nutrition, died after sustaining injuries he received while jumping into the lake. 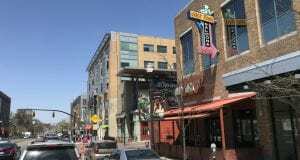 As a result, Undergraduate Student Government voted to support ending the jump, and OSU’s administration put out a statement saying it would work to put the tradition to an end. OSU spokesman Chris Davey said the intention of the redevelopment — which contains both aesthetic and environmental aspects — is not in reaction to the tragedy or to stop the Mirror Lake jump, even if the timing of the construction accomplishes that goal. When asked about plans for the jump during a September meeting with The Lantern, University President Michael Drake said there were discussions surrounding what would be done, though he didn’t mention the years of planning. “We are having discussions with a variety of people on campus and off campus about that, and that’s something that I then can’t talk about, because I don’t want to get in the way of those discussions,” Drake said at the time. Gerard Basalla, president of USG and a fourth-year in political science and strategic communication, said that students need to realize the jump is over. Basalla said students have a right to be mad about the jump ending, but it is something that needs to happen to keep students safe and prevent possible injuries. Basalla said USG is not planning to create a new tradition to replace the Mirror Lake jump, though that was included in the resolution USG put forward when it voted to end the jump. The new designs of the lake would make it nearly impossible for students to jump in, said Keith Myers, associate vice president of planning and real estate in OSU’s Office of Administration and Planning. The altered lake will extend farther east toward the South Oval and will have an eight-to-ten-foot shallow wetland around its edges. In addition, a new drainage system will be built, which can drain the lake in less than a day. It currently takes multiple days for the lake to fully be drained. 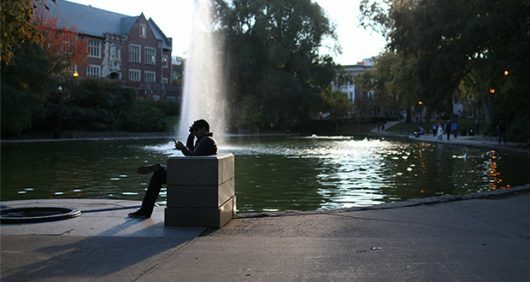 A forum in 2014 with more than 200 people in attendance, including faculty, staff, students and alumni, was one of the first opportunities for students to have a say in what the new Mirror Lake might be. “Faculty leadership were involved in the early phase discussions, which began about two years ago,” Davey said, noting consistent participation from Drake. 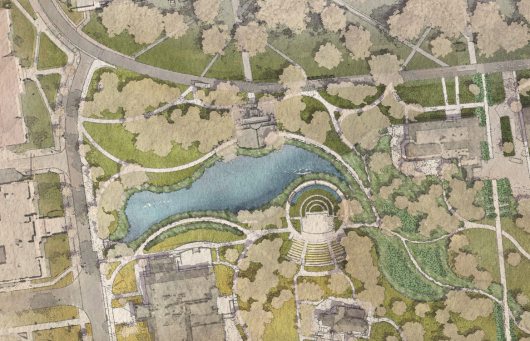 After the faculty discussions and forums surrounding the lake, a consensus was reached to restore the lake to a design reminiscent of its original state, but no definitive concepts were made until recently, said OSU Provost Bruce McPheron. The vision of the renovation is to make Mirror Lake look as it did in the 1870s when it was a natural hollow, rather than a constructed body of water. To coincide with the sustainability goals of OSU, the renovations of Mirror Lake are designed to fix old problems and prevent new ones from occurring. He said that this previous expansion of the body of water made some of the original walkways, paths and steps inaccessible, including those that used to lead to Pomerene. As well as promoting the biodiversity of certain trees that have been preserved in the area, he said the redesign of the lake would allow for more stormwater treatment to take place. In addition to the focuses of the renovations being sustainability and convenience at the forefront of the reasoning behind the Mirror Lake closing, the administration also said the lake construction coincide with renovations of the adjacent Pomerene Hall and the Browning Amphitheater. This construction project, slated to go past $4 million and thus require Board of Trustees approval past that point, is set to be introduced at the next board meeting, Davey said, but investigation of the properties of the lake will begin once it has been drained. McPheron said that he is prepared to hear a variety of opinions regarding the renovated lake. “slated to go past $4 million”… do you mean it’s expected to cost more than $4 million? because go past doesn’t make sense. Also, you buried the money. Regardless of how you feel about the construction and/or the jump, it is INDISPUTABLY INCONSIDERATE for the university to announce these plans the day construction starts. The article notes that these plans have been in the works for a long time, so there is no reason the school should blindside students with an announcement the lake is drained. I was conducting a semester-long observational study on the ducks of Mirror Lake for my Behavioral Ecology class. IF I HAD KNOW THE LAKE WAS GOING TO BE DRAINED IN OCTOBER, I WOULD NOT HAVE SELECTED MIRROR LAKE AS MY STUDY LOCATION IN AUGUST. Now I have to completely start over my entire research project halfway through the semester and throw away all the hours of observation I already logged at the lake. OSU has the right to renovate campus, I understand that, but they blatantly have no consideration for how their choices affect students. I agree that it was inconsiderate but they did mention long term construction that was to start sometime during the fall semester. This was something that an OSU spokesperson mentioned to the press in March of 2016, so the public did know about it and you had the ability to research this location and/or inquire between March and August. I hate to say this but if this is a semester-long study, whoever designed the study could have had a little more foresight. You have every right to feel that way Irritated-my sympathies. Usually they give more advance notice but they are acting more and more like a business-with little consideraton for academics or academic pursuits. The fear of another episode like last year’s fatality that occurred during the Mirror Lake jump drove the narrative and not because the Board of Trustees have any real concern for student safety-it is the liability issues that they care about. Expect no sympathy from University Administrators who have more disdain for learning especially when it interferes with the Brand they are marketing…..
Good luck in kickstarting a new research project that will aid you in your pursuit of education- the goal that use to drive decisions here but sadly no longer does. If memory serves me correct, isn’t the company doing the renovations owned by Eddie George? Also, isn’t Eddie George on OSU’s payroll?